The WIGeoWeb mobile provides field staff with more flexibility. This mobile GIS enables on-site geomarketing analyses and data acquisition via tablet. The WIGeoWeb mobile software is designed as a geomarketing web app. It can be used on all tablets, irrespective of the operating system. WIGeoWeb mobile uses HTML5 to guarantee future-proof technology. 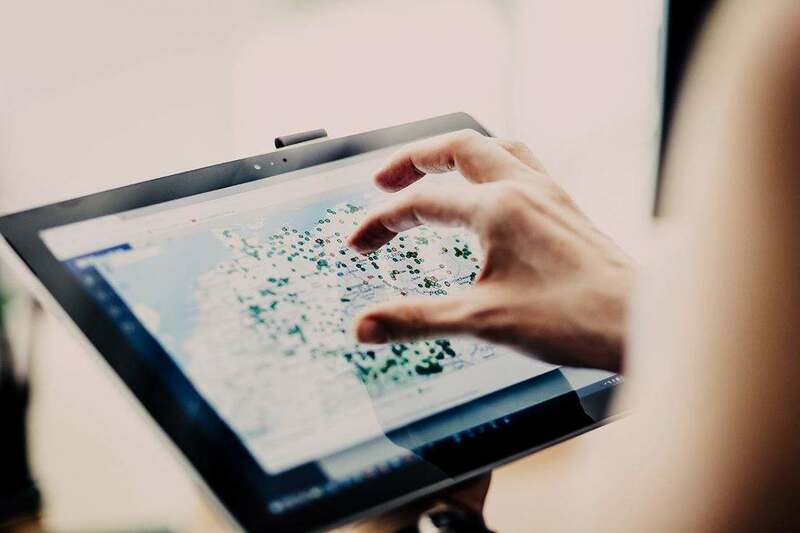 The demand for tablet-based geomarketing applications is now rising strongly in the business sector. It is a logical trend, because what could be more suitable than acquiring and inputting geodata and current information about a specific location when the field service employee is right there on site? WIGeoWeb mobile makes this possible. The field sales force in particular profits from mobile GIS because the latest data required by field staff for their schedules is available directly via their tablets. WIGeoWeb mobile is linked to the company databases and the CRM system. This means that geomarketing analyses can be called up at any time. This enables discussions about potentials directly on site with the retailers. The geographic analyses very clear show how sales and turnovers are distributed across the market according to products and target groups. The retailer can view and understand the economic situation in a map format more rapidly and easily. This not only applies to the retailer on site, but also in general for franchisees, branch managers and site operators. WIGeoWeb mobile enables even complex analyses on a tablet. For instance, data drilling can be used to display sales figures at all different levels of the sales structure. This mobile GIS evaluates sales on all these levels, broken down by products and all product specifications. Automotive example: WIGeoWeb mobile visualises, for each retailer, what type of vehicle, brand, model and equipment is sold in which areas. "The depiction of such high complexity is very unusual in the field of mobile GIS and geomarketing web apps", said Georg Magenschab, CTO and managing director at WIGeoGIS. Field staff can also maintain and update data whilst underway with the WIGeoWeb mobile. WIGeoWeb mobile can also be individually adapted to the needs of a company. This applies, for instance, to hierarchy and sales structures, analyses, display modes, data and access to this data via a detailed rights and roles concept. "The individualisation of a GIS is now an important criterion for companies. The same applies to geomarketing apps", said Georg Magenschab. This is why WIGeoGIS ensured their mobile GIS had the highest possible flexibility. WIGeoWeb mobile is designed to be a geomarketing web app and not a so-called native app. The difference: Native apps are developed for a specific operating system, usually iOS (Apple devices) or Android (e.g. Samsung). Such apps therefore run only on special platforms. Web apps such as WIGeoWeb mobile are device-independent. The technological base is HTML5. This makes WIGeoWeb mobile a future-proof mobile GIS solution. Please send me more information or contact me.